Mason faculty and students create an interpretive 3-D sculpture called “Mental Floss.” The sculpture depicts 13 different neurons that are located in the hippocampus, the region of the brain responsible for processing autobiographical memories.“Our goal for this project was to provoke viewers to ponder not only how intricate and complex the inner fabric of the brain appears, but also how beautiful and awe-inspiring it can be, providing a bridge between rational thought and emotions,” says Ascoli. Artists and scientists approach creativity, exploration and research in different ways and from different perspectives. But when people from these disparate fields work together, they have the potential to create new knowledge, ideas and processes that help us see the world around us in a different light. 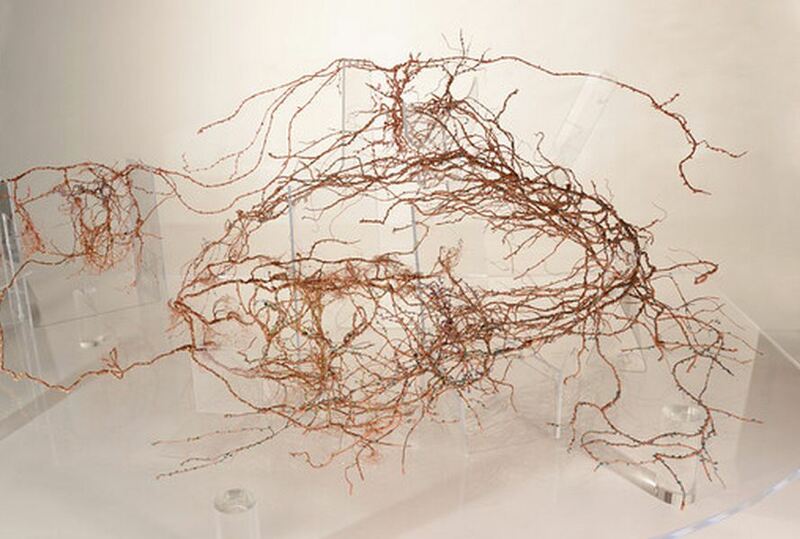 This is exactly what several Mason faculty and students set out to accomplish when they created an interpretive 3-D sculpture called “Mental Floss.” The sculpture depicts 13 different neurons that are located in the hippocampus, the region of the brain responsible for processing autobiographical memories. Funded by Mason’s Center for Consciousness and Transformation, the project originated as a science+art exchange project organized under an umbrella initiative called the SOFAlab. SOFAlab is collaboratively administrated by Mason’s School of Art; the Smith Center for Healing and the Arts; and the Hamiltonian Artists, which was founded by Paul So, associate professor in the School of Physics, Astronomy, and Computational Sciences and the Krasnow Institute for Advanced Study. An artist and scientist himself, So was approached by a colleague in the School of Art, professor Helen Frederick, about the project, and he and Frederick later joined forces with Giorgio Ascoli, University Professor of Molecular Neuroscience in Krasnow. Ascoli’s research aims to understand how the brain relates to the mind at the level of neuronal morphology – the “shape” of nerve cells. His lab uses advanced experimental and computational techniques to visualize these tree-like structures in virtual reality. After much deliberation, Ascoli, Frederick and So decided to create a project that would truly integrate art and science. Enlisting the help of two Hamiltonian Artist fellows, the team began work on the project in spring 2011. Alice Quatrochi, BIS ’12 Fine Arts and Educational Psychology, led the team. She was joined by Alex Giller, senior theater major. “Although my background is in graphic design and illustration, my own motivation for joining this project grew from a desire to learn more about neuroscience and cognition and to have access to neuronal images as sources of inspiration,” says Quatrochi. Todd Gillette, PhD student in neuroscience, guided them through NeuroMorpho.Org, the largest international collection of 3-D neuronal constructions, which is managed in Ascoli’s research center. The team chose to construct 13 different neurons that represent the four regions of the hippocampus. They analyzed all the different parts of the neurons, including the dendrites, axon and soma, and how they are connected to one another. This analysis, notes Quatrochi, helped them appreciate the complexity, beauty and functionality of neurons. 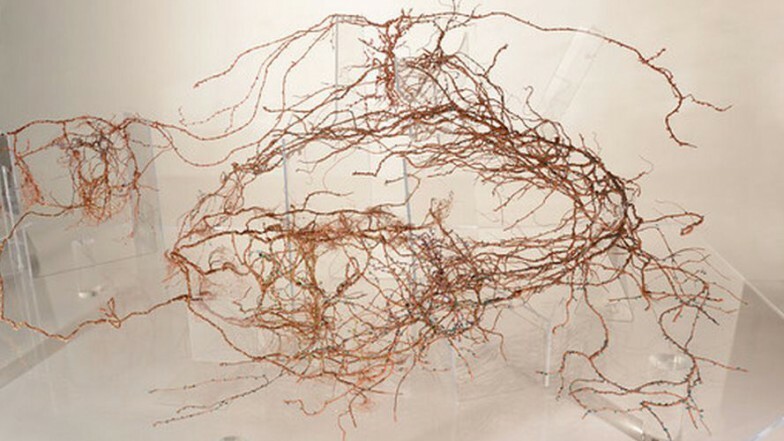 Quatrochi, Giller and Ascoli decided to build each neuron separately with metal wire. They tried five different ways to construct and connect the neurons, but none was quite right, often leaving the sculpture too brittle. After a thorough analysis, Quatrochi headed to the hardware store and emerged with hundreds of feet of telephone cable. Back in the art studio, Quatrochi and Giller cut open each cable to reveal the copper wiring, the perfect material to hold the various twists and turns of each neuron. The team spent the next several months manipulating the wire to develop the aesthetic identity of the piece while portraying as faithfully as possible the shape of the neurons. Glass beads were threaded on the wiring to attract light and identify each neuron by a unique color. The project was completed this past summer and was displayed at the Howard Hughes Medical Institute’s Janelia Farm Research Campus in Ashburn, Va. There are also plans to take the sculpture to conferences, museums and galleries around the country. In the meantime, “Mental Floss” is displayed in the Great Room in the Krasnow Institute on Mason’s Fairfax Campus. A description of ‘Mental Floss’ and video of the model are available online. Mental Floss was on exhibit at Janelia Farm conferences for the month of November 2012 and highlighted during the November 11-14 conference – Neuron Types in the Hippocampal Formation: Structure, Activity, and Molecular Genetics.